Ask Jennifer Adams: Is buying or reupholstering used furniture worth it? having furniture professionally reupholstered is generally expensive. In fact, it could cost as much as a new piece! Q: Even though I have a decent job, I can't afford to buy the new furniture I want. I do see things I like at garage sales or used-furniture places, but I'm wondering if it is worth it. How do you know if something isn't infested with bugs? My mom had all her furniture reupholstered often when I was a little kid. Is that a cheap way to get the look I like? A: Your pain is real. New furniture these days is expensive. But remember: No furniture is worth it if you don't really like it or need it. It's better to wait until you find a piece you can't live without. Sometimes, however, you really do need to live with what you have or buy as inexpensively as you can. New upholstery is a great way to extend the life of a quality piece, but having furniture professionally reupholstered is generally expensive. In fact, it could cost as much as a new piece! Long term, though, new upholstery for a sofa or chair can make sense if it's a high-quality collectible, or if you really, truly love it and it just needs new fabric to be useful. Fortunately, there are less expensive and easy ways to change up the look of something you need but don't really love. Recover a sofa or chair yourself with large pieces of fabric by the yard that you do love, or with textural bedding such as a coverlet, throw blanket, or even a tablecloth. Simply drape the fabric over the entire chair and tuck in around the cushions. 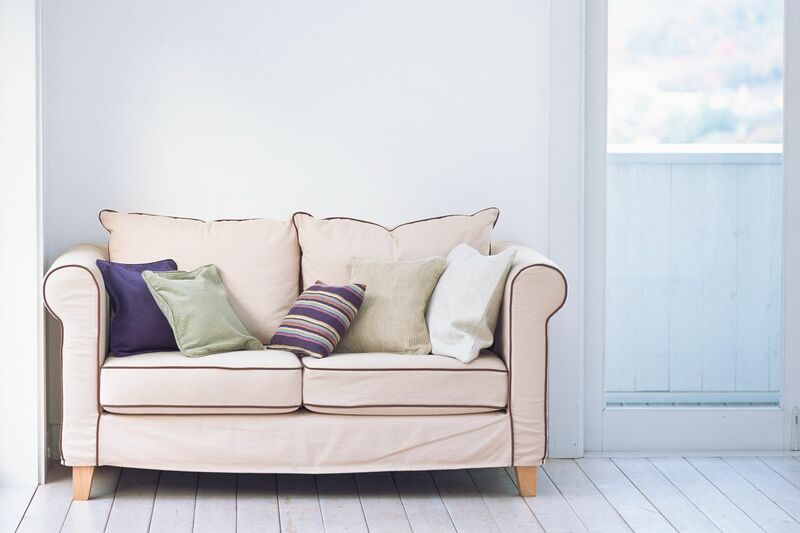 To avoid used furniture with bugs or bad odors takes a little bit of effort. If you see or smell anything that makes you squirm or feel slightly uneasy, don't buy it! Sniff along the corners, near the floor. Remove the cushions, and turn the piece over if you can. For evidence of insects, look carefully in all the corners and crevices, along zippers and where the upholstery meets the frame. This could include small black or red stains or spots, dead insects, eggs, or even live insects. Used furniture may have minor odors of its previous home or general mustiness. Often this may dissipate with a good vacuuming and an afternoon sitting outside in bright sunlight. Good luck, and let me know what you find. Have a design dilemma? Jennifer Adams is an award-winning designer, TV personality and author of the upcoming book "Love Coming Home: Transform Your Environment. Transform Your Life." Send your questions to AskJennifer@JenniferAdams.com or for more design ideas, visit Jennifer's blog on her website at www.jenniferadams.com.